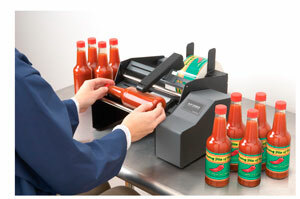 Bottle and jar and cylinder label applicator for single label apply. We are selling this high capacity bulk tank pigment ink label printer for a customer. The printers are popular for fast printing of large format labels onto say our SJET BS5609 label media for chemical drum labels and outside storage applications. Suited to every day usage, not for one sand two's this one.